LABOR RATE $85 HOUR. DIAGNOSTIC FEE $85 WITH A MINIMUM OF 1 HOUR. AT (803) 939-9393 PICK UP STARTS AT $65.. . 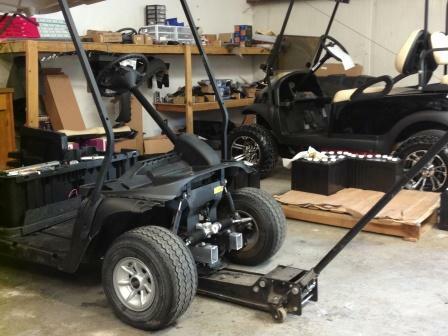 Custom Golf Carts Columbia is your #1 shop for unparalleled service when you need golf cart service, repair, customization, rebuild, or refurbishing. Our golf cart service department is available at all times to address the smallest of your queries. If your golf cart has been malfunctioning on the field or not running properly, just schedule a check by one of our expert technicians. They can assist you with checking gas and air filters, belts, oil levels, proper operation and speed, and battery terminal coatings among many other possibly dysfunctional components of your cart. Other potential problems your equipment could be facing include insufficient battery water, dirty connections to the battery, lack of lubrication in switches and control links, and maladjusted brakes. Our experienced staff understand that our customers are busy people with several commitments. Thus, we take the responsibility of making sure your cart’s always good to go when you’re out for some golf or just cruising the area. Besides that, golf cart service maintenance checks are recommended by industry experts to be conducted on a regular basis. We offer the best golf cart service and repair rates in town. We even offer replacement parts and even options to customize for all brands listed above and many more! Our goal is to provide our customers with the highest quality golf cart service and parts at the lowest possible cost to you! This is why all our work is done in house at our 855 Chapin Road location in Chapin, SC. None of our work is subbed out to other companies or individuals, so you can trust the service you receive by our experienced and knowledgeable staff and technicians. Call and speak to one of our Customer Service Representatives today and let us serve all your golf cart service and repair needs!